During his visit to the United States, Pope Benedict XVI will address the United Nations General Assembly. He will also celebrate the creation of the first U.S. archdiocese and the bicentennials of four other dioceses. Baltimore was established as the first diocese in the United States of America in 1789 and John Carroll was named as the first bishop. Due to the rapid growth of the United States, in both area and population, the Holy See established four new dioceses in 1808: New York, Philadelphia, Boston, and Louisville (established as Bardstown and moved to Louisville in 1841). At the same time, the Diocese of Baltimore was made an archdiocese and Bishop John Carroll became the Archbishop. Over the years, as the population grew and dispersed, the dioceses of New York, Philadelphia, Boston and Louisville were made archdioceses and many other dioceses were carved out of their former territory. The coats of arms of all these archdioceses will be displayed during the papal Mass at Yankee Stadium on April 20. While he is in Washington, D.C., Pope Benedict XVI will stay at the residence of the Apostolic Nuncio, Archbishop Pietro Sambi. The residence is called the apostolic nunciature. The nuncio is the Vatican’s ambassador to the United States. (The United States and the Holy See have had full diplomatic relations since 1984.) Like other ambassadors, Archbishop Sambi represents the Holy See’s views on various issues to the U. S. government. In addition, he acts as a liaison between the Holy See and the Church in the United States. He announces the appointment of new bishops and often attends their ordination or installation as the Vatican’s representative. Since 2006, Archbishop Sambi has attended 35 such events! The nuncio attends the semi-annual meetings of the United States Conference of Catholic Bishops and addresses the bishops at these meetings. In fact, Archbishop Sambi announced the Pope’s April 2008 visit at the November 2007 general meeting. Archbishop Sambi is the second apostolic nuncio to the United States, succeeding Archbishop Gabriel Montalvo who served from 1998-2006. Prior to 1998, there were two apostolic pro-nuncios and 10 apostolic delegates. The first apostolic delegate to the United States was appointed in 1893. 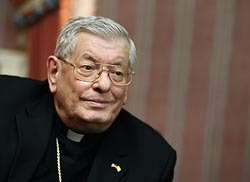 Archbishop Sambi was born in Italy in 1938. He holds a doctorate in Sacred Theology and Canon Law. Before coming to the United States, he served in Cameroon, Jerusalem, Cuba, Algeria, Nicaragua, Belgium, India, Burundi, and Indonesia. He served as the apostolic nuncio in Israel and Cyprus and Apostolic Delegate in Jerusalem and Palestine from 1998 until his appointment to the United States in December 2005. Pope Benedict XVI began his second encyclical, Spe Salvi, with the words of St. Paul: “In hope we were saved” (Romans 8:24). The Pope then asks: Why do we need to hope for our salvation? Paul himself tells us why. He states: “We know that all creation is groaning in labor pains even until now; and not only that, but we ourselves, who have the first fruits of the Spirit, we also groan within ourselves as we wait for adoption, the redemption of our bodies. For in hope were saved” (Romans 8:22-24).